Babblings of a Mommy: Beauty Mint: Personalized Skin Care by Jessica Simpson and Nerida Joy. Beauty Mint: Personalized Skin Care by Jessica Simpson and Nerida Joy. With hundreds of options for your skin care needs, it's hard to figure out what products will work for you, and what will not. Everyone's skin is different, and unfortunately we waste a lot of time and money on products that don't necessarily work for us. Beauty Mint takes the guessing game out of our skin care routine and created a brand new line that specifically targets all our troublesome problems. 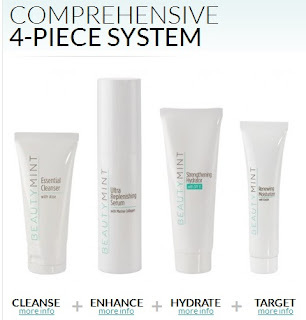 Created by celebrity skin care expert Nerida Joy and hollywood starlet Jessica Simpson, Beauty Mint is a personalized system that features exclusive products that combine the most advanced anti-aging technology and science with nourishing botanicals. I took the free online consultation and got my results in matter of minutes, and thanks to Beauty Mint, I got to try out my comprehensive 4 piece-system as well! Beauty Mint Essential Cleanser with Aloe. Nothing is more important than clean skin when it comes to bringing out the best in all your products. This gentle, lightly foaming cleanser washes away dirt, makeup and impurities, leaving skin feeling fresh and soft. This Cleanser is super gentle and lightweight and didn't irritate my skin one bit. Loved it. Beauty Mint Ultra Replenishing Serum with Marine Collagen. Time depletes our body’s collagen supply, sapping skin of its youthful firmness, smoothness, and glow. Comprised of an incredible 50% marine collagen, our exclusive serum targets visible and future signs of aging from every angle. The serum is silky smooth and because it's made out of 50% marine collagen it even has a slight ocean smell. Beauty Mint Strengthening Hydrator with SPF15. Well-hydrated skin is skin that’s strong, toned and radiant. The ultra-hydrating and protective ingredients in this weightless lotion are delivered to skin with our patented technology designed to maximize benefits. This is a thicker lotion, but it left my skin soft and refreshed. Beauty Mint Resurfacing Treatment with Retinol. Reduces the appearance of brown spots, freckles, and patchiness for skin tone that looks more even and vibrant. Because of the Retinol I expected this treatment to feel medicated, but I was pleasantly surprised on how light it was and also how soft it left my skin! Overall, I've been very impressed with the Beauty Mint system and I can't wait to see the final results! I'll be sure to keep you guys updated on any changes I see, but for the meantime here's a video on how Beauty Mint came about and how it's different from what's on the market now. I am so curious about this line. I took the quiz, but have not ordered anything yet. Are the products natural and do they contain any parabens?